Iterations of the waterfall don't clarify how organizations should allocate their time and effort in reference to inbound and outbound activities–nor should it. Every company is unique and will have a different mix of both for their marketing strategy. If you’ve been following our growth-driven series, you would know that inbound is the method of organically pulling prospects and customers to your business and products online through the creation and distribution of helpful, valuable content. While outbound is a way to deliver marketing messages to consumers when they’re not specifically searching for your content. In this blog, we will explore the five factors that influence your inbound and outbound mix while our upcoming one will show how to implement them both for an integrated approach. Inbound and outbound marketing complement each other. Many activities associated with inbound will create the assets that make up the backbone of your outbound strategy. But determining the proper mix of inbound and outbound marketing is complicated and often goes beyond the jurisdiction of marketing and sales departments. Your inbound-outbound breakdown will depend on the goals of your organization. We aren’t talking touch-feely, everyone gets a trophy goals. This means goals from the top - your leadership team, your c-suite, your board of directors. What is the vision for the entire company? Where does the collective organization want to go? What needs to be systematically accomplished to move the needle? To state the obvious, a sustainable business needs to generate revenue (or at least have enough people believe that it can generate revenue in the future). Revenue must then exceed the expenses needed to run the company. However, for most small to medium-sized businesses, growing revenue and growing it fast is the primary objective. Once you have defined your goals, the next step is establishing your base. Your inbound strategy should always come first. This includes optimizing your website, SEO, and mapping out content. Doing these things effectively will yield results, but those results will take time that aggressive growth plans will not tolerate as a complete marketing strategy. When growth needs to happen, and happen fast, it means more outbound tactics are needed to bring content in front of the right audience. Outbound marketing techniques like PPC, paid social, and sponsored content start to shine here. If you took a random sample of the general population, how many people would know your company existed? Brand awareness in the B2B space is a different animal. It doesn’t matter if the general population knows who you are and what you do, but it does matter a great deal that the right audience does. For example, we partner with a large manufacturer of wire and cable. You probably have some of their products in your house, behind your walls, or receive your electricity from one of their overhead conductors. It’s also likely that you have never heard of them. But if you’re an electrician, electrical engineer or work for a utility company, you certainly know who they are. This doesn’t mean that we don’t do any outbound marketing activities, we just do it more strategically and for specific campaigns. We don’t have to be as aggressive in using our budget to build brand equity. By contrast, our smaller clients in the B2B space are trying to amplify their expertise. For them, we may use a larger portion of their budget promoting content. One effective way to do this is to partner with trusted industry sources to host content or co-sponsored webinars. This aligns smaller companies with prominent media sources that are a go-to source for specific B2B audiences. Last year, a 30-second advertisement during the Super Bowl cost approximately $5 million, which is one of the quickest ways to reach 100+ million TV viewers (plus countless others via YouTube, etc.). Don’t have a spare $5 million in your marketing budget? Time to get strategic. As mentioned, B2B companies aren’t concerned with everyone knowing who they are, as long as the right people know. Generally speaking, outbound marketing is going to cost more than inbound, but there are an abundance of digital marketing opportunities that allow you to reach your desired audience for a fraction of traditional advertising’s cost. Tactics like account-based advertising, partnering with industry media, and sponsored research all cost more up front but lead to faster results. Getting more leads upfront through outbound efforts amplifies traditional inbound techniques, like email, by giving you a better database of qualified leads to work with. Additionally, any content created through outbound activities, like a sponsored webinar, can be repurposed for inbound marketing. A sense of urgency within an organization will always play a role in determining the inbound-outbound mix. When do your goals need to be accomplished? What is your typical sales cycle? Are there seasonal fluctuations that occur? 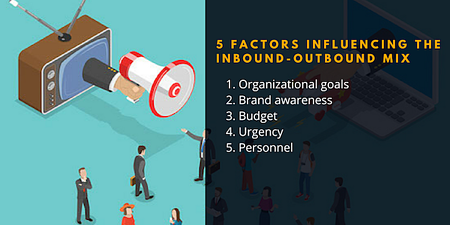 These factors will also impact when you use more inbound versus outbound tactics. If you typically sell more during a specific season, you want to ramp up your outbound marketing during that time to help get the word out. Alternatively, during slower sales cycles you can invest more in inbound marketing to shore up your base. If your organizational structure is heavily dependent on sales teams and has very few marketers, your plan is going to lean more outbound heavy. There is no way a small marketing team can support enough inbound activities to quickly ramp up and feed a sales machine. Alternatively, if your marketing team is bigger than your sales team, there may be enough oranges in the inbound juicer to keep the inside sales team sipping away without the need to supplement with outbound activities. Many factors will influence the amount of inbound and outbound marketing channels that you use as part of your overarching marketing strategy. Because these factors are spread out across many parts of an organization, it is rare that they would all remain constant for long periods. We developed this calculator to help make sure your organization is on the right track. Simply score each of the questions based on the factors mentioned above and weigh them based on your company priorities. For example, this is what the breakdown could look like for a company that had was heavily invested in revenue growth targets but was more balanced in the other facets. 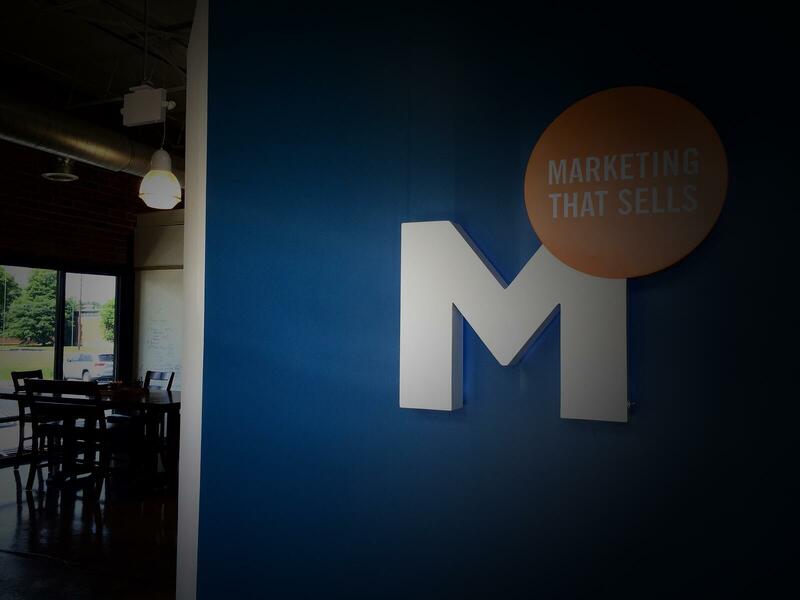 By creating a solid inbound marketing foundation and aligning your sales and marketing teams, you can be a more agile organization that uses strategic outbound opportunities to accelerate results and growth. Stay tuned for our next blog, where we wrap up the series and walk through the steps of integrating inbound and outbound for optimal results. Missed out on the last two blogs? Check them out now.